A Photographic Guide To Nudibranchs of South West England was published in the spring/summer of 2014. 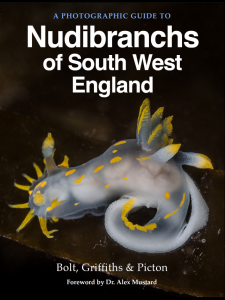 Available in both Apple’s iBook and the more open ePub electronic book formats, it covers over 60 species of Nudibranch that live in the lush seas of the south west of England. Nudibranch expert Bernard Picton teamed up with nudibranch enthusiasts and underwater photographers Terry Griffiths and Dan Bolt. Making use of Bernard’s unsurpassed knowledge and Terry & Dan’s 50 years of diving in the south west was a powerful combination which has created a completely new and up-to-date reference guide. The book, in both iBook and ePub formats, is now only available for purchase if you email one of the authors. Once the £9.99 cost is received via paypal we will send you the relevant file for you to use. PLEASE NOTE: Recent DNA work has lead to a small number of taxonomy changes for a few species in this book. The authors do not intend to release an updated version at this time.